The KMS California Hair Play Makeover Spray is basically a fancy product name for a dry shampoo, and this was the first dry shampoo that I ever tried back when my hair was super oily. I had high expectations for this dry shampoo as it was given to me by my best friend who is a professional hairdresser, and even though she warned me beforehand that most dry shampoo's don't tend to work, I still believed that this was going to be the miracle product that I had been searching for. Sadly this product did very little for my hair and left me feeling incredibly underwhelmed. The Juuce Shock Treatment is marketed as being a 3-5 minute deep conditioning treatment for dry, coloured hair that is meant to replace the normal step of conditioning once or twice a week. I used this treatment on my hair every 2nd wash for 3-4 months, and although it made my hair feel soft while it was still damp, my hair quickly became dry, brittle and unmanageable within minutes of beginning to air dry. I first started using the Nak Heatbeat Protective Shampoo and Conditioner together 6 months ago after going through a terrible stage of having oily roots just hours after washing. Going by the name and description of these products I had zero expectations of them fixing up this problem, but they did! I don't know what it is about the formulation of these two products but for the 5 months that they lasted me my hair not only felt healthy and manageable without being too oily/too dry, but I was also able to air dry my hair in under an hour. 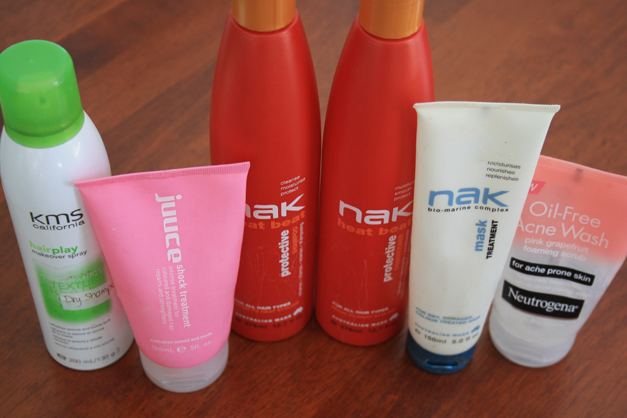 After finishing up the Juuce Shock Treatment I started using the Nak Mask Treatment every 2nd wash alongside the Nak Heat Beat Shampoo, in the exact same way that I was originally using the Juuce Shock Treatment. Unlike the Juuce Shock Treatment however, this one lasted me for 4-5 months and actually left my hair feeling softer for a few hours after rinsing. Would I repurchase? Yes, but not for that price. I recently finished up my 6th or 7th tube of this delightfulness, and as I have mentioned before in previous blog posts, it's a firm beauty favourite of mine. Not only does this foaming scrub smell amazing, but it leaves my skin feeling fresh, clean and smooth! Have you guys ever tried any of these products before? What were your thoughts? I totally forgot about how awesome your skin feels after using Neutrogena's scrub *___* Smells so good! Office Tour: How I Stay Organised.